U.S. District Judge William Orrick issued the preliminary injunction Tuesday in response to two lawsuits filed by the city of San Francisco and Santa Clara County. The ruling was the third judicial check to the Trump administration’s immigration policy. Campus political science lecturer Terri Bimes said the Supreme Court has already set a precedent stipulating that the federal government cannot impose new spending restrictions. Bimes added that in the case of National Federation of Independent Business v. Sebelius, former president Barack Obama’s attempt to block Medicaid funding as a means of enforcing Medicaid compliance was ruled unconstitutional by the Supreme Court. Bimes said these executive orders are examples of presidential overreach and violate the 10th Amendment, which defines the separation of powers between federal and state governments. 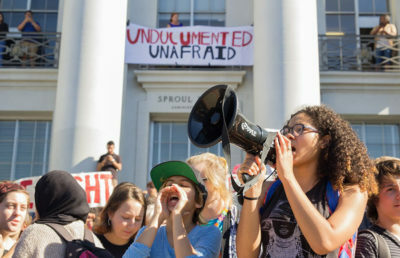 Democratic Senate Leader of California Kevin de León said, in an interview with MSNBC on Tuesday, that any attempt by the federal government to coerce state and local governments to comply with federal immigration authorities would be met with legal resistance. De León added in the interview with MSNBC that threatening to withhold federal dollars from local police would be “both illegal as well as unconstitutional” because such funds are crucial for combating human trafficking, drug trafficking and terrorism. 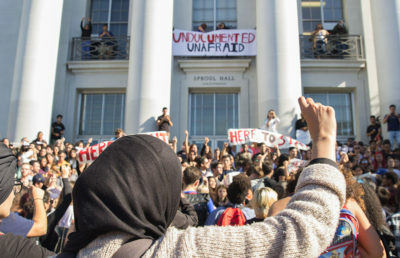 Undocumented campus graduate student Arturo Fernandez said in an email that he believes these executive orders are unconstitutional and that the president is using government resources to propagate a racist and xenophobic agenda. 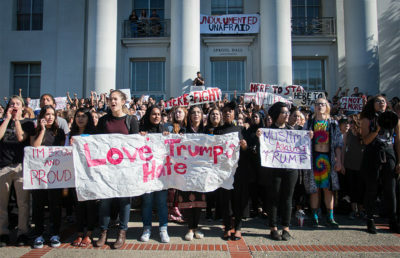 “Cal students, undocumented and not, likely feel better knowing that our system of checks and balances will impede the President from getting away with unconstitutional and immoral actions,” Fernandez said in an email.